It's very important to learn how to make "special" Candies if you want to progress through Candy Crush Saga. Here's how to make a wrapped candy. 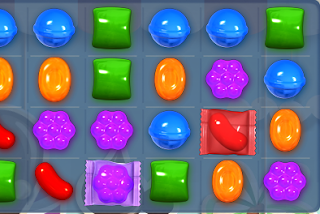 To make the L shape with 5 candies. First get your candies into the shape below, You only need one candy in the position shown, I was lucky and had a choice of 2. How to make a wrap from a T shape. Look carefully for the chance to get your candies into the position shown, then move the top yellow down to form the T shape. You can also have the T laying on it's side. Here's what the wrapped candies look like. 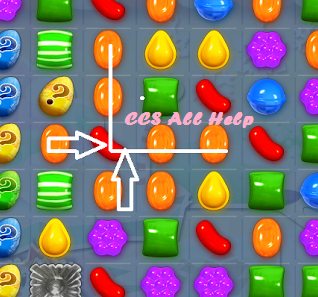 Below is a video showing the player making wrapped and striped candies using both the L and T shapes, watch carefully and learn how to spot the patterns you need. The video has a commentary explaining the moves. the L and T shape are easy once presented. how about hints/patterns to look for 2, 3 moves ahead? try uninstalling both and reinstalling and syncing both again. Ann, the only way to sync is to use the Facebook server. I'd you don't have a FB account, create one, and then when CC opens let it sync to FB. A hint: if the sever is slow at syncing, keep CC open, go back to FB, look for the 3 horizontal bars on the top of the page, far left, open, find your CC app & click on it again. Then go back to CC. It will give you a "failed" message with a "retry". Hit retry. The program will now sync in seconds. Btw, you will also have the roulette wheel once a day to spin for a booster. 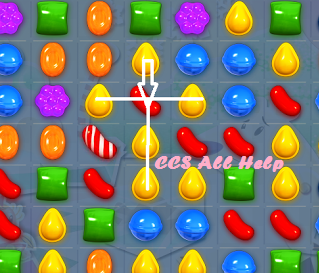 This is the best video of a Candy Crush game. She went slowly and the commentary allowed me to see where was moving the curser. I wish she would do this for the upper levels.